Lindsay and Christopher wanted their wedding to be a mini-vacation for their guests. They found the perfect destination complete with gorgeous views, golf, boating, and shopping at the Grand Traverse Resort & Spa in Traverse City. With help from the resort’s staff, the couple’s Grand Traverse Resort wedding was exactly what they’d envisioned. A weekend trip north for Chicago residents Lindsay Thompson and Christopher Lipari helped them find the ideal location for the Labor Day weekend wedding they envisioned. Naturally the couple sought a venue that would make a lovely stage for their wedding, but the venue would also have to feel like a satisfying mini-vacation for their guests, many of whom would be traveling long distances. Her family is all in California and Chicago. His family is in Detroit. 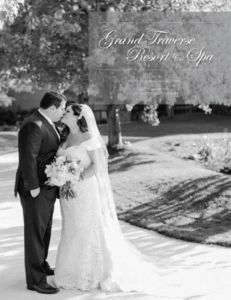 The couple selected the Grand Traverse Resort and Spa in Acme, just east of Traverse City, in large part because of the connection they made with Liz Brooks, Grand Traverse Resort’s special events manager. “She played a huge part—we felt we connected with her on the first day we met her. She had answers to all of our questions, could accommodate all of our guests, and she executed our vision. Every time we talked with her she made us feel we were a priority and she was going to bat for us—and she did,” Lindsay says. The Grand Traverse Resort’s numerous offerings and amenities—golf and tennis, on-site spa and pool, boating, shopping—also helped seal the deal. That the resort was re-doing its beautiful Tower rooms was a bonus. “So many of our guests ended up raving about that,” Lindsay says. View Lindsay and Christopher’s wedding in the 2016 issue of MyNorth Wedding! To achieve that plein air, natural feel, the couple worked with a vendor who decorated the poles of the Grand Traverse Resort’s own Plaza reception tent—located near the golf course—to look like towering trees. Lights made the branches sparkle. An altar designed by the couple featured willows. “Her style was on point—it was very classic, very elegant, not over the top. It was the perfect amount of perfect,” the resort’s Liz Brooks says. Click the cover to read the latest issue of MyNorth Wedding! Find more inspiration in the MyNorth wedding directory!